Lake Ohrid is a transboundary lake between the Republics of Macedonia and Albania. 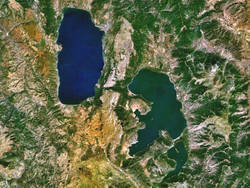 With more than 200 endemic species described, the lake is a unique aquatic ecosystem of worldwide importance. This importance was emphasized, when the lake was declared UNESCO World Heritage Site in 1979, and included as a target area of the International Continental Scientific Drilling Program (ICDP) already in 1993. The lake is considered to be the oldest, continuously existing lake in Europe. Concurrent genetic brakes in several invertebrate groups indicate that major geological and/or environmental events must have shaped the evolutionary history of endemic faunal elements in Lake Ohrid.